There’s nothing more irritating than spilling something all over the upholstery of your Toyota – especially right after you just finished detailing it. From a cup of coffee that tips over during your drive to work in the morning to the kids leaving the leftovers of their afternoon snack in the back seat, it seems like there are countless hazards that stand between you and keeping the interior of your favorite car, truck, or sport utility vehicle (SUV) in pristine condition. 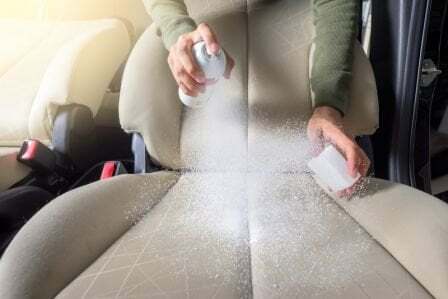 We here at Westbury Toyota know how annoying it can be when you’ve got an unintentional mess in your car, especially when it leaves behind a lasting stain. However, you don’t need to stress out if this happens! If you have an unsightly stain on your upholstery, you don’t need to schedule an appointment with an auto detailer. Instead, you can easily remove the stains on your own by following these few simple steps we’ve put together for you. Before you get started, you’ll need to assemble a few key materials and components to ensure that the job gets done right the first time. For our DIY approach, you’ll actually be making your own stain remover. Fortunately, most of these ingredients are already hanging around your house or easily found at your local home goods store, so putting together this quick and simple list shouldn't take more than a few minutes. The first part of this process, according to the editorial staff of AutoDeets, is to mix the warm water and baking soda together into a paste. You’ll then apply that paste directly to the stain with either a small toothbrush or scrub brush. Let it sit for at least thirty minutes (or longer, if it’s a large or deep stain). After that you can remove the paste by blotting at the stain gently with a dry, clean microfiber towel. You'll want to make sure that you absorb as much water as possible while you do this in order to make sure that the next step in the process goes according to plan. Once you have wrapped up blotting the original cleaning solution off of the stained area, go ahead and mix the warm water, vinegar, and dish detergent together in a spray bottle. From here, you will want to apply it to any remaining stains, making sure to cover the whole area. Once you’ve done that, use a stiff-bristle brush in order to work the vinegar and detergent mixture into the stain. Let it sit for about fifteen to twenty minutes. As soon as this waiting period has passed, feel free to use another dry cloth/towel to pat at the stain, absorbing any excess moisture. After you’ve finished all that, you might find that your car smells like cleaning products. To get rid of this potentially unwanted scent (and to speed up drying), it’s a good idea to just leave your windows open for the rest of the day (weather and temperature permitting, of course). Doing this ensures that the smell has a chance to air out and evacuate the interior of your Toyota, all while leaving the inside of the vehicle with a fresh, clean scent. As the staff at BestDIY explains, there are alternative cleaning methods you can also try if you aren't quite comfortable with the approach we have covered above. Some of these might work best with smaller stains or stains that have not yet set in. These methods are also cheaper than getting your car professionally detailed, so that’s something to keep in mind. Club soda is cheap, easy to find, and also works very well at removing upholstery stains. You can apply it by pouring it carefully over the stain or using a cloth, though you might find putting it in a spray bottle works best. Baby wipes can also get stains out, provided that you use them right away as their effectiveness dwindles on stains that have already set in. A mixture of clear ammonia and water is a great stain remover, particularly on the carpet of your vehicle’s floor. If you're not looking for a DIY solution, stopping by your local automotive shop and checking out the upholstery cleaning kits and scrubs for sale there can also work. As you can see, getting the stain out of the upholstery of your Toyota isn't nearly as much work as one might expect; you just need to find the approach that best suits your comfort level and capabilities. We know how important a clean car is to most drivers. We also know that if you don’t have the time or budget to get your car professionally detailed every time you or a passenger spill something, it helps to have alternative methods. The DIY methods we’ve listed here are great time and money savers – and are also proven to work. With all of this in mind, don’t fret the next time you find a stain or unsightly blemish on your car's interior. Instead, just set aside a little time after you leave work or on the weekend, gather the quick and simple list of supplies we covered above, and put to good use all that you've learned here!